Primitive Fall is Right On Time Autumn Hand Painted Pallet Sign. Check out this new pallet sign style of sign. Made new for my Country Sampler Magazine Ad, August 2018. Love love love this new sign. Painted a milk chocolate brown color with distressed edges. 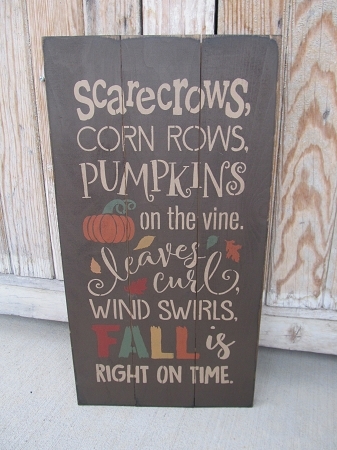 Saying is Scarecrows, corn rows, pumpkins on the vine, leaves curl wind swirls Fall is Right on Time. Has pumpkin and leaf accents. Size is 20" long by 10 1/2" high. Hanging options available, shown with a sawtooth hanger. Solid pine wood, made in the USA hand painted, designed and signed here at Gainers Creek by Heidi!! !